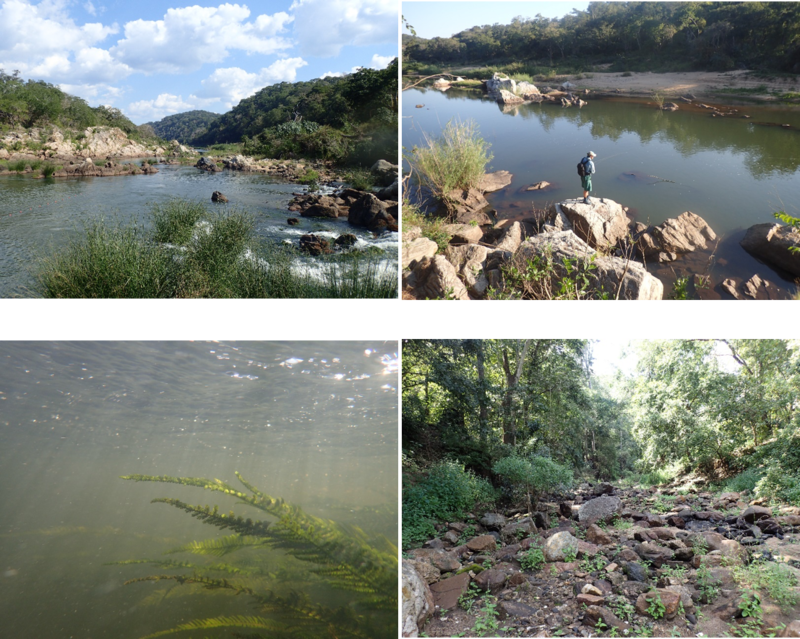 During February and July 2017, Mahomed Desai, senior researcher and PhD candidate was part of a team that undertook an ecological survey within a selected area of the Pungwe Catchment in Mozambique. 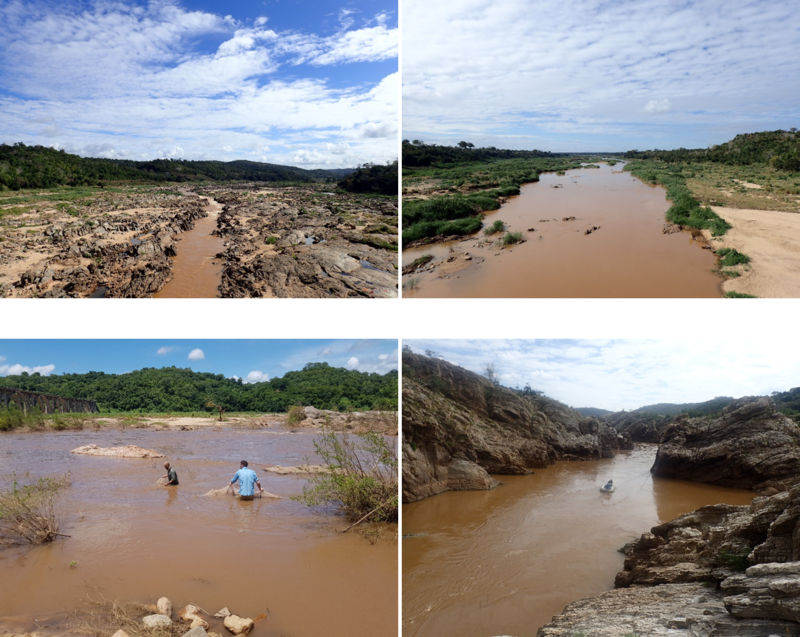 The Pungwe River is shared between Mozambique (95% of the basin, generating 65-70% of the runoff) and Zimbabwe (5% of the basin, generating 30-35% of the runoff). The Pungwe River and its associated tributaries are highly dynamic and possess a relatively high diversity of habitat and biotope types, possibly due to the geomorphological nature of the system. 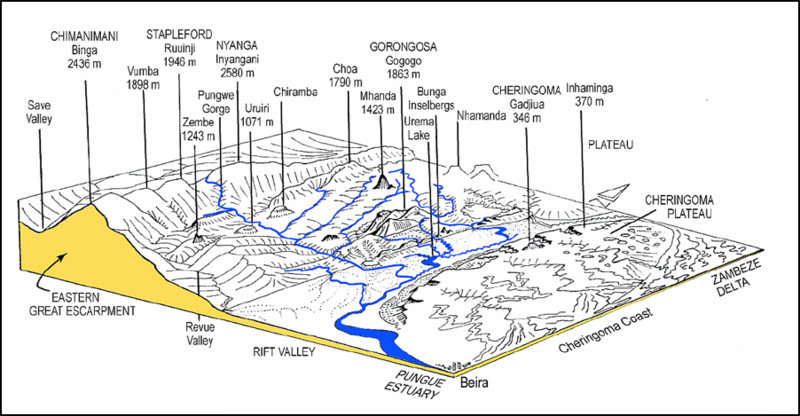 The Pungwe mainstem can be described as torrential and is possibly due to the predominance of bedrock in the system as well as the topographical nature of the catchment. 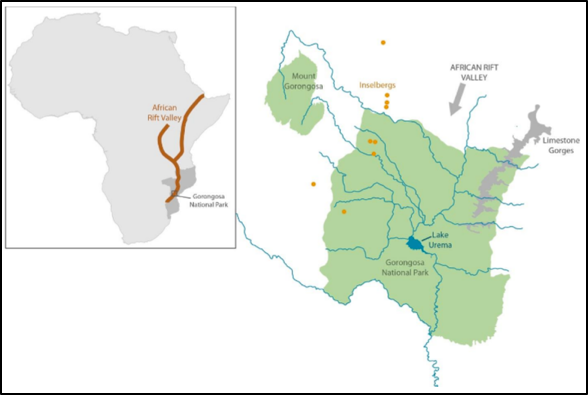 However, the river widens and flattens as it traverses the southern tip of the African Rift Valley – See Figures 2 and 3. One of the major tributaries of the Pungwe River within the survey area is the Muazi River. The river is also bedrock-dominated (Figure 4). During the low flow season the turbidity of the system reduces and supports a population of Hydrostachys polymorpha, a rheophilic aquatic macrophyte (Figure 4). The species is currently listed as ‘Vulnerable’ and plays an important role in supporting an array of aquatic biota. In addition, within the survey area there are numerous creeks with a gravel and sand thalweg that drain into the system (Figure 4). These creeks provide a refuge area for various aquatic biota but these are however seasonal. Nevertheless, during low or zero flow periods there are isolated pools connected by sub-surface flow that provide habitat. As a consequence of the relatively high diversity of habitat types and biotopes within the system, including the survey area, the region supports a relatively high level of biodiversity, both terrestrial and aquatic. Of special interest within a regional context are the ichthyofauna, Odonata and terrestrial insects. These organisms although not as visible as other ‘charismatic’ species such as birds or larger mammals nevertheless are important in maintaining ecosystem processes and thereby overall wellbeing. A total of 38 species of ichthyofauna were recorded during both seasonal surveys and were typical of the Zambezian fauna. The dominant families were Cyprinidae, Mochokidae and Mormyridae. The ichthyofauna and formed unique communities within the system based on availability of cover features and substrate preferences, per redundancy analyses. 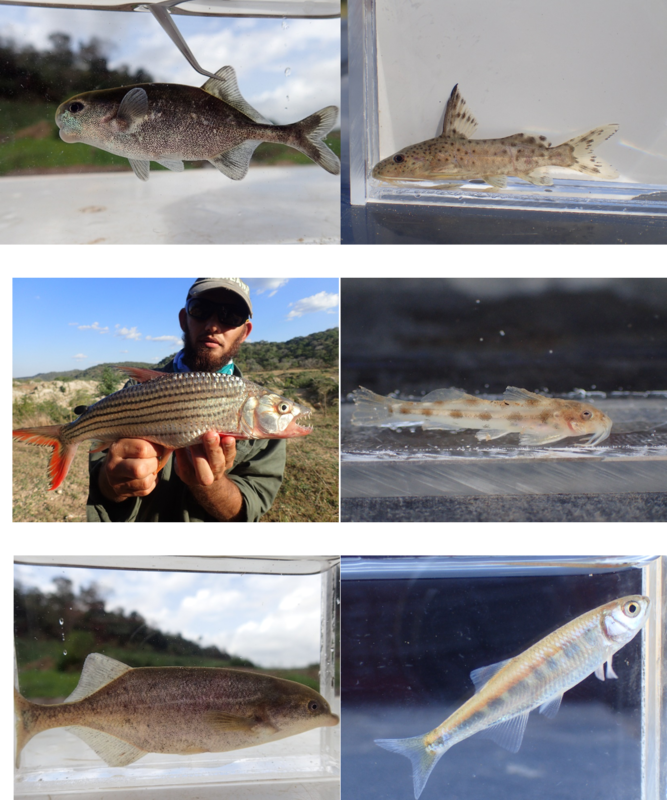 Figure 5 illustrates some of the species recorded within the survey area. In addition, a new species or species complex of Chiloglanis (Mochokidae W. K. H. Peters, 1868) was recorded for the survey area (Figure 6). The species was typically associated with rapids and runs and utilised aquatic macrophytes, rocky crevices and cobble/boulder substrates as cover. Although data does not exist on dietary requirements, based on closely related species, it is assumed to feed on “aufwuchs” or the periphyton and invertebrate community that inhabit sold surfaces of lotic systems. Due to the characteristics and size of the system as well as its inherent biodiversity, the system provides an array of ecosystem services to local communities and to society within a larger regional context. These services are varied and include subsistence fisheries, sediment deposition for agriculture, raw materials and pest control amongst others (Figure 7). However, no formal quantitative or qualitative studies have been undertaken and these are postulated based on previous knowledge from other systems and observations during the survey periods. Therefore, future research of this subject within the region should be considered if funding is available. Although the region possesses a substantial level of biodiversity the only formally protected area is Gorongosa National Park (GNP), located within the Lower Pungwe River. The Pungwe River delineates the southern boundary of GNP (Figure 8). Seasonal flooding from the Pungwe inundates shallow pans and oxbow channels on the Rift Valley plain at the southern end of the park. This flooding is vital for the newly constructed 6200 ha wildlife sanctuary near Chitengo and the DingeDinge Marshes at the confluence of the Pungwe and Urema rivers. During the high flow season, the Pungwe River branches and forms the Nhanvu River that flows into the Urema River upstream of Lake Urema and subsequently the Muaredze River before joining back into the Pungwe River. During the dry season, the Nhanvu River transforms into a series of pans (Figure 8). 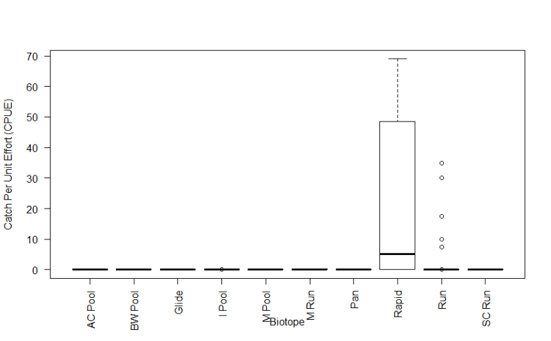 Nevertheless, these pans perform a vital function by providing refuge and/or nursery habitats evidenced by the relative abundance of Enteromius species, including E. haasianus, and juvenile life-stages of species recorded within the respective pans during the survey (Figure 8). During the high flow season when connectivity to the Pungwe River is restored, species are able to disperse and colonise new available habitat. 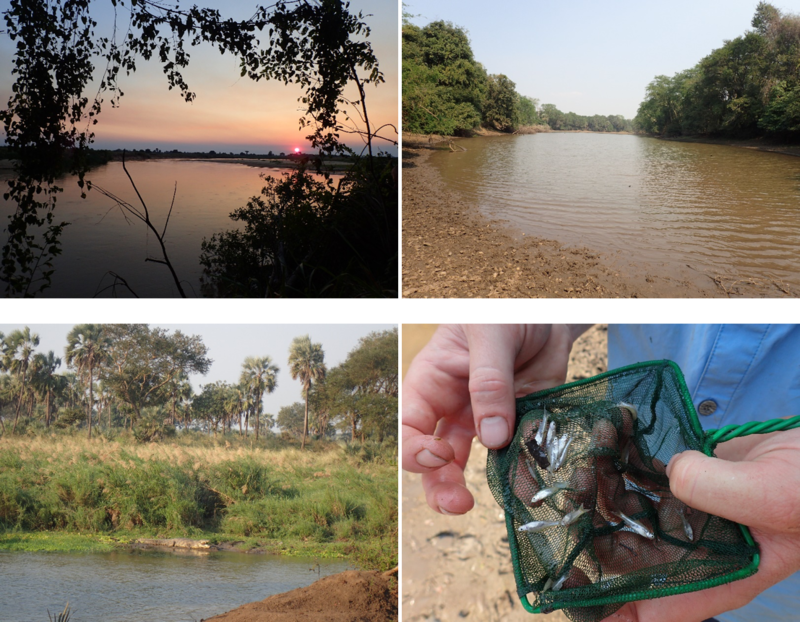 Therefore, the connectivity between the pans and the Pungwe River is regarded as critical to maintain the wellbeing of the local ichthyofauna population. 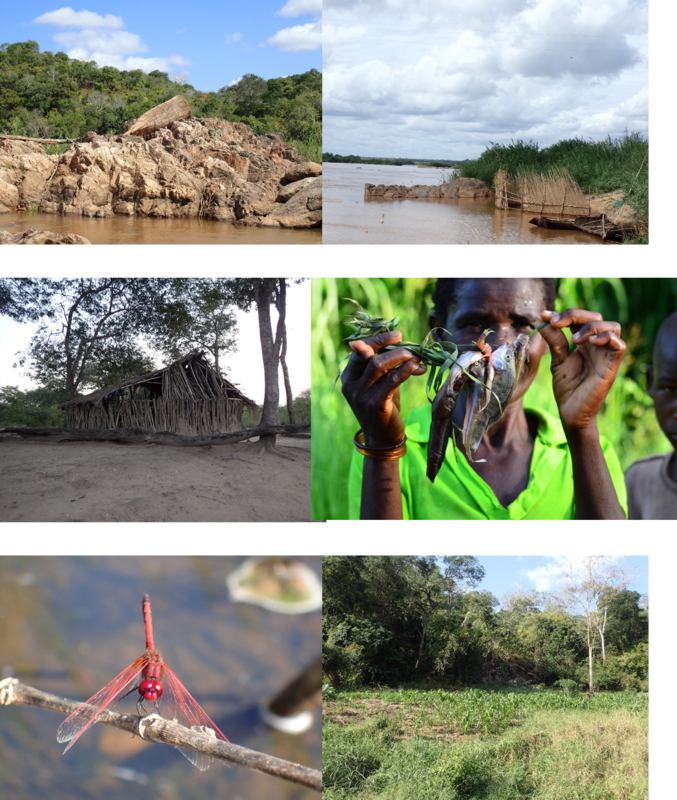 At present, there are no significant water resources development projects in the Pungwe River basin in Mozambique. However, demand to harness Pungwe waters for inter-basin water transfer, municipal water supply, salinity control, hydropower, flood mitigation, large irrigated agriculture (sugar) schemes, and other uses is increasing. Furthermore, unsustainable use of the system and its catchment is leading to a decline in biodiversity and ecosystem wellbeing. Given the substantial socio-ecological importance of the system, it must be sustainably managed in a holistic manner involving all stakeholders as well as formally conserved in key areas.